Officials say one resigned and the other is suspended after patient in At least 300 acres have burned so far, no evacuation plans in place at this time. 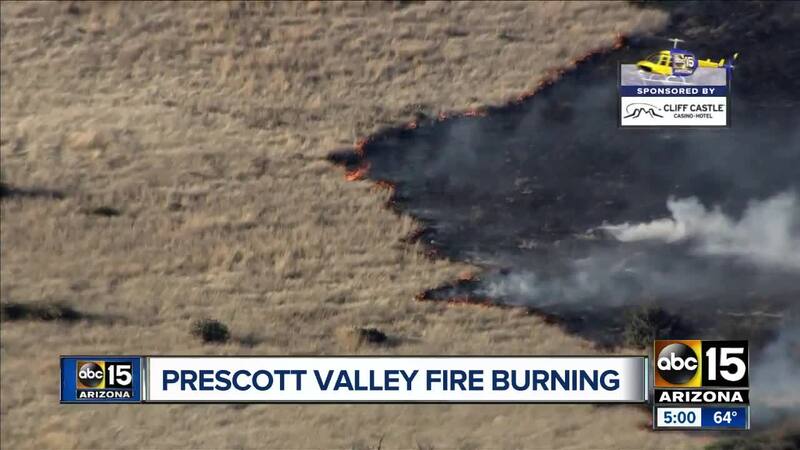 PRESCOTT, AZ — Fire crews have fully contained a more than 400-acre brush fire that ignited in the Prescott Valley area Monday afternoon. Central Arizona Fire and Medical says it’s unclear what started the fire, but the flames quickly spread because of heavy wind in the area. Central Arizona Fire and Medical says it's unusual to have brush fires in that area around this time of year. Firefighters remained on scene throughout the night and well into Tuesday before declaring the fire, which burned 459 acres, 100 percent contained. Crews say no homes were damaged in the blaze. The cause remains under investigation, according to the Arizona Department of Forestry and Fire Management.